Not a lot of surprising names on that forwards list, but maybe an eyebrow-raiser on defense. Perhaps it’s hard not to miss the comparison of the numbers of those defensemen to those in the 1987-88 list; perhaps, then, these next two charts aren’t too surprising, either. There were simply more defensemen shooting higher percentages of their team’s shots. 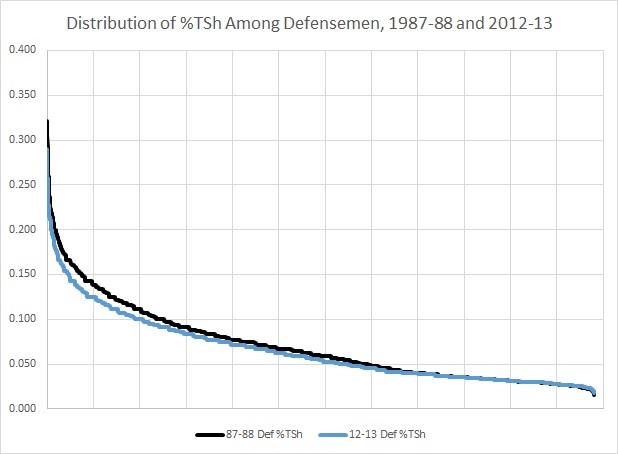 In other words, you can’t look at the decrease in offense as a function of more defenseman involvement in offense; in fact, this might be an indicator of defensemen deciding to not jump into the rush, a sort of anti-Bobby Orr trend. So maybe, rather than Dustin Byfuglien or Jack Johnson being “riverboat gamblers,” they are 1980s defensemen who’ve become unstuck in time. It’s important to add, however, that this doesn’t register in any change of defensemen’s percentage of shots taken in-total. 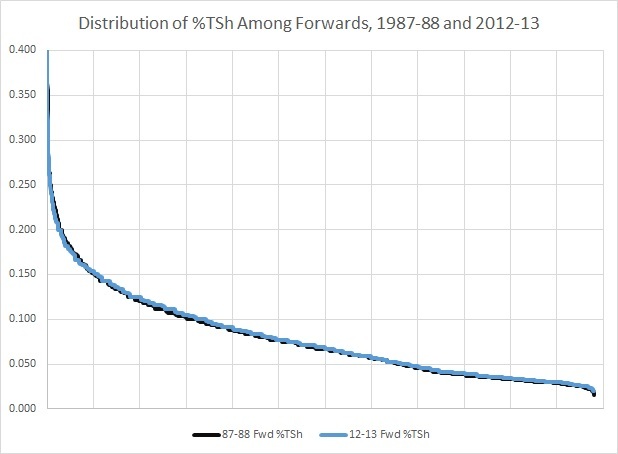 Forwards are still taken about the same percentage of overall shots, and among forwards the distribution remains nearly identical. This suggests that forward usage (4 lines, with top 6 getting primary minutes and the 3rd having a checking role) has remained the same. It also suggests that teams are using roughly the same “systems” with regards to their defensemen, thought its possible that there has been more reliance on 3rd pairing powerplay specialists, or some other diffusion of those shots. Whatever the case, any systems argument, or any discussion of the evolution of the game, has to tackle these fundamental truths: that the game has a form and a process, that players have long developed best practices* for this form, and despite any lip service to “better systems” the numbers suggest similar results. With this information, it becomes very apparent that low scoring is not going to go away by tweaking the size of leg pads. And a kernel within this is probably where “shot quality” surrenders to the immutable fact that all teams want scoring chances, and want to prevent scoring chances; the best teams accomplish both, and no team purposely takes shots without trying to score. 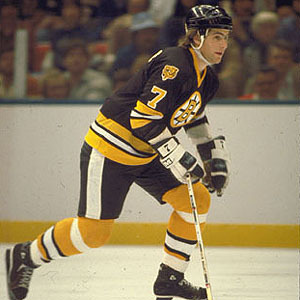 *Probably the most recent, “new” best practice is trying to carry the puck into the zone, a holdover from Soviet-era hockey; Eric Tulsky at Outnumbered has covered this extensively. In that piece, Tulsky speculates that maybe, indeed, the Kings have a unique system that’s generating shots.